Pete Andrews reviews the iShoot Sniper, a wireless flash trigger with a claimed range of 500 metres. How does it fare? I now have a couple of these iShoot Sniper units to review, courtesy of UKhighland.co.uk – to whom I owe much thanks. First impressions are that they are fairly well-made and should stand up to (reasonable) professional use. Second thing is they look like a slightly enlarged version of a PocketWizard TT5 – except they don’t support TTL flash of any sort – although they will “wake up” a hibernating Canon or Nikon TTL strobe fitted to the hotshoe. Functionally they are very similar to a PW PlusII, at less than half the price. They’ll trigger hotshoe and studio strobes with both + and – polarity trigger voltages. Claimed maximum voltage into the female PC socket is 250v, which is higher than a PW, although I haven’t tested this to the limit yet! I’ll see later how they stand up to my old Bowens monolite 400 with its 220v synch. Update: The Snipers refused to trigger the ancient Bowens, and one of them was injured in the process. The PC socket trigger died on one unit, although the hotshoe triggering still works. Nice to know there’s some built-in redundancy! 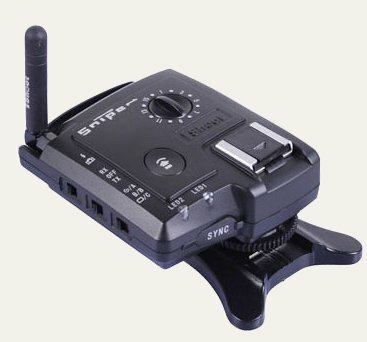 The Snipers also function as a remote camera release with pre-focus control, but you need to buy (or make) a separate connector lead for this, since one isn’t supplied. The socket for the release cable is a standard 2.5mm stereo jack, so it should have been easy to make a DIY connecting lead. (If anyone’s interested, the connections are: Common to sleeve; Focus trigger to ring; Shutter trigger to tip. All fairly straightforward.) Update: Putting together a camera trigger wasn’t as easy as I thought. The 2.5mm socket is slightly recessed, so many plugs simply won’t fit. In the end I filed down a cheap 2.5mm to 3.5mm stereo adapter bought from a mobile phone shop. Once I could actually access the socket it worked as advertised, triggering the focus and shutter release of the camera. Ishoot really need to supply a camera lead of choice, or at least make one readily available. Range: Realistically NOT the 500 metres claimed. The frequency used is 2.4GHz, which means walls, wood and metal will all absorb and cut down the signal considerably. Triggering should be reliable within the same floor of a fairly large building, but from outside to inside I could only get about 30 metres away through a double brick wall before triggering became erratic. This is fair enough. I’m not going to try and fire my studio strobes from down the street while I’m having a coffee in Starbuck’s. Update: A further outside test in clear country showed that 300metres was about the absolute limit, although it was raining slightly when the test was done. This test also showed that the Snipers were reasonably weatherproof, but I still wouldn’t like to use them in a real downpour. There are 16 radio channels available, plus 3 sub groups for flash triggering. I’m really not sure what purpose these “groups” are supposed to serve, since they can’t be triggered altogether, but only switched between individually. Adjacent-channel immunity is excellent, and it seems impossible to trigger the units accidentally. Other points: The Sniper’s male hotshoe feeds through from the camera to a second female hotshoe on top of the unit – but again no TTL signals are connected, only wakeup and synch. However this does mean that old film-dedicated hotshoe strobes can be used without your DSLR locking up. This hotshoe feed also enables other radio triggers to be stacked on top of the Sniper, which is handy if you already have a set of triggers and want to expand them. Delay time: There is a tiny delay between the camera synch and remote flash triggering. I’ve been able to accurately measure it using a storage oscilloscope at 680 microseconds. While this doesn’t sound a lot, it’s enough that you probably won’t be able to use the maximum synch speed of your DSLR with these Sniper units. For example I had to reduce the shutter speed of my Nikon D700 from 1/320th to 1/200th before the whole frame was cleanly exposed. I imagine that the maximum useable synch speed will depend on the particular camera and strobe units used, so YMMV in this respect. OK. So as far as I can tell at this stage, the iShoot Sniper offers a much cheaper alternative to a Pocket Wizard II, with a comparable performance. I would like to have seen a synch lead included in the rather nice-looking boxes they came in, but you do get a free hotshoe stand thrown in. I’ll try to keep this site posted about how the Snipers work out over the next few weeks. And once again, thanks to Roger at UKhighland for giving me the chance to test these units out. Update: The manual firing button on one unit has become sticky after a few weeks of use. The button stays on after being depressed and needs a bit of a “flick” to make it turn off. Not good! The iShoot Sniper is available from UK Highland Photography for £70.00 per transceiver, including VAT. They are also sold on eBay for US$139.99 each.